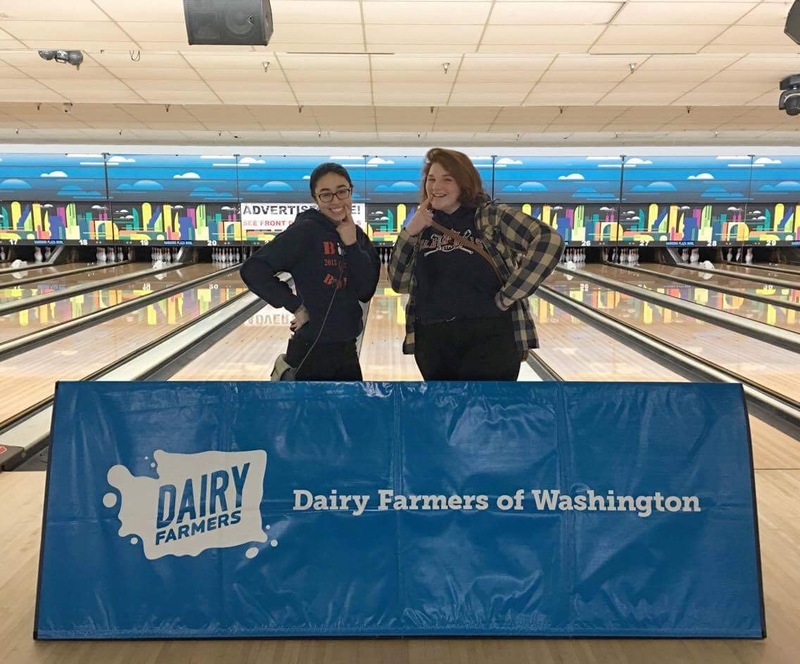 Grace Gibbs (left) and Elsa Means (right) posing with this year’s state competition banner after both ranking in the top 8 for individual bowlers. 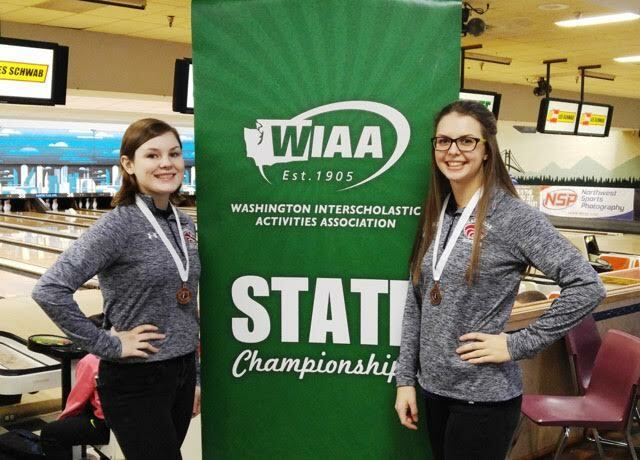 This year’s season for the Black Hills High School Bowling Team ended with two girls placing in the top eight at Washington state competition, Grace Gibbs placing eighth and Elsa Means placing sixth. And this is just the icing on the cake of the team’s fair share of accomplishments throughout the season. So what makes this team so great? It helps that they have two ready and willing team captains to help bring a team to glory. Vivian Jones and Kimberly Perry, seniors at BHHS, have been on the bowling team for four years and each have their own book of achievements to helped them fulfill their role. “We’ve both varsity lettered multiple times in bowling, and I’ve been to the State Championships as an individual bowler,” Perry shares. 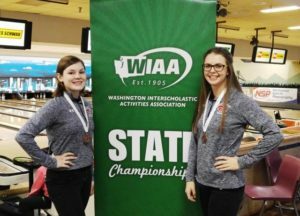 Both girls also hold a high score of over 200 for individual bowling – quite an accomplishment. The BHHS Team Captains, Vivian Jones (left) and Kim Perry (right) have fun while enjoy their last year as Black Hills senior bowlers. To achieve these results, it takes a lot of hard work. The team has weekly practices at local Tumwater Lanes where they work on different skills. The practices include warm ups, reviews for the day, a reminder of overall goals and several challenging games. A favorite of these being “Low Ball”, where team members try scoring the lowest score without guttering, with the goal of working on outside shots. The team is up and coming, securing league championships the past couple of years and consistently spending some time at the top of their league. This year, Jones and Perry are both excited for the promising team they leave behind as they graduate. One of these younger bowlers is Elsa Means, a junior at BHHS and a first time state attendee who exited ranking in the top eight for individual bowlers, sixth place to be exact. For Means, bowling is more than just an extracurricular, it’s a serious look into her future. 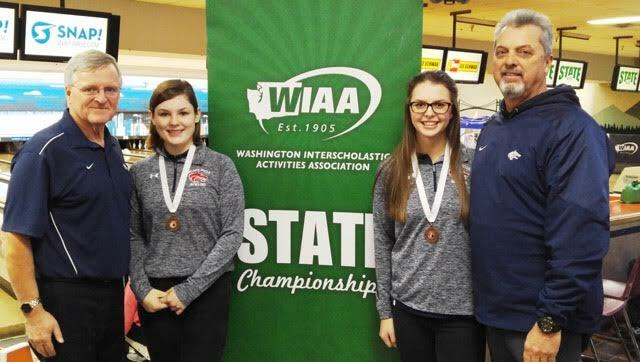 (From left) Coach Creed, Grace Gibbs, Elsa Means and Don Means proudly display their medals and victory smiles after this year’s state competition. “Right now I’m looking at multiple D1 schools that offer bowling programs. Even if I don’t get a chance to play in college, I know for sure I will still bowl in leagues and play in tournaments,” Means explains. Means has come far in only three years of the sport. She admits that bowling was never on her radar before she joined, but a nudge in the right direction from another coach at the school had her intrigued. It’s a great sport in which to track an athlete’s progress. Perry herself started freshman year as “most improved bowler” and has ended her high school career as co-captain of the team with Jones, her close friend in and outside of bowling. And bowling isn’t their only shared responsibility. The girls are also officers for the school’s Key Club, take part in costuming for the school’s theater program and Means participates on the Wolves softball team alongside bowling teammate Grace Gibbs. With all these other extracurriculars, what is it about the sport of bowling that’s so different that it keeps them coming back? For a lot of the girls, it’s the mixture of individual competition and team participation. “Bowling is different in that your scores are individual to you, but the social aspect and team encouragement is a big deal,” Jones explains. Of course it’s not as easy as it all may seem. The individuality of the sport is very often a highlight, but sometimes it can get in the way. It can be hard to maintain consistency when you rely only on yourself. The girls agree that having a bad day can affect the way you bowl and if you’re about to play a game, you have to be careful to not get inside your own head too much. Consistency is key in this sport and it can be one of the most challenging aspects to achieve on both ends of the spectrum – you can’t get yourself down for not executing a shot like you had hoped, but you also can’t let yourself get too excited when something good happens unexpectedly. “You have to keep the same mindset the whole time,” Means says. The girls on the Black Hills bowling team have two wonderful coaches to thank for their opportunity this season. Creed Clement, the volunteer assistant coach and owner of Tumwater Lanes, has brought a new aspect of the sport to the girls, and they have made a point to notice the love he has for their team. They also have great thanks for Don Means, head coach and father to Elsa Means, who maintained their competitive spirit while showing them how to have a good time. Bowling has made its mark at Black Hills with its great attitude, accomplishments and teamwork. Although the season has ended, the spirit of the game stays alive until next season begins.